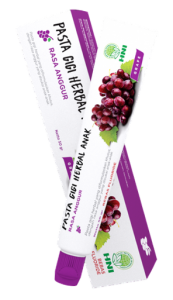 A herbal toothpaste specially formulated for kids in grape flavors. Sorbitol, Calcium Carbonate, Aqua, Hydrated Silica, Flavor Grape, Glycerin, Xanthan Gum, Lauroyl Sarcosinate Sodium, Propylene Glycol, Salvadora Persica, Piper Betle Extract, Sodium Saccharin, Xylitol, Sodium Benzoate. Apply proper amount of toothpaste onto the toothbrush. Brush your teeth thoroughly, then rinse your mouth with clean water.